PHOTO: Eileen Ossen, center, Executive Director of the Jeffrey P. Ossen Family Foundation, poses with Paul Pedchenko, left, Manager, Windham Hospital Emergency Medical Services and Shawn Maynard, right, Executive Director, Windham Hospital Foundation, next to the new paramedic intercept vehicle that was recently purchased with a $47,407 grant from the Jeffrey P. Ossen Family Foundation. 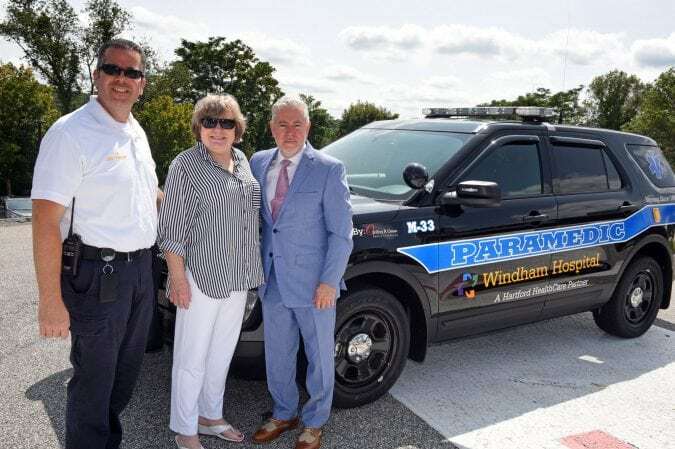 The Windham Hospital Paramedic Program, one of the few hospital-based paramedic programs in Connecticut, has strengthened its fleet thanks to the Jeffrey P. Ossen Family Foundation. The Foundation has awarded a $47,407 grant to the Windham Hospital Foundation for the purchase of a new paramedic intercept vehicle for the hospital. The 2018 Ford Interceptor Utility V6 All-Wheel Drive vehicles were officially put into service last month. The new SUV joins another recently purchased vehicle for the program. The two new vehicles replace a pair of 2011 Expedition SSV, each with over 200 thousand miles. The older vehicles will now be utilized by Public Safety on the Windham campus. The new rides were put into action quickly. The day the new vehicles entered service, paramedics responded to two heart-attack calls. This is the latest in a series of generous donations from the Ossen Foundation, named in honor of local businessman and philanthropist Jeffrey Ossen, who passed away in 2007. In 2004, it was a $500,000 gift to the hospital from Ossen’s foundation that started a capital campaign for the renovation and expansion of the Emergency Department that now bears his name. Windham Hospital is a Hartford HealthCare partner. For more information, call 860.456.9116.